In January 36 people completed my Practical Ed Tech course called G Suite for Teachers. A couple more people started this weekend. The course is designed to equip you with the skills you need to feel confident using G Suite for Education tools in your classroom. If you have been thinking about taking the course, but had some questions, take a look at the following FAQs. The first lesson of the course is available to you as soon as you complete your registration. After that two new lessons will be sent to you ever week until you have all ten lessons. If you want to move through the course more quickly than that, that’s an option too. 2. My school doesn’t have G Suite for Education yet, can I still take the course? Yes, you can. In fact, many people have taken the live version of this course without their schools having G Suite for Education in place. They took it as a way to get familiar with what they would be using when their schools did make the complete transition to G Suite for Education. 3. Is there graduate credit available? There is not graduate credit available for this course. I am, however, able to provide you with a certificate for five hours of professional development. 4. Is there a time limit on the course? You can start the course any time that you want to and finish it whenever you like. The default pacing is two lessons per week, but you can complete it quicker or slower than that. 5. Are there any discounts available? Yes. If you register five teachers from the same school/ school district, you can register five more for free! In other words ten people can join for the cost of five. Have more people than that? Want to register your whole school? Contact me at richard (at) byrne.media for information discounts for larger groups. 6. I teach math/ science/ elementary school/ will there be anything for me? Absolutely there will be! 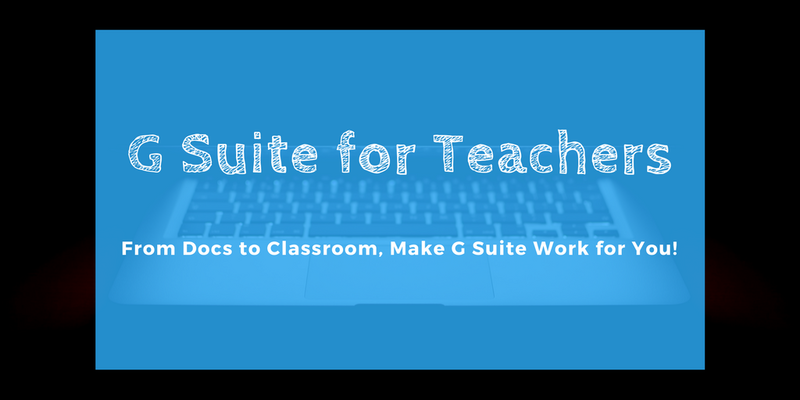 This course is designed to teach you how to use the tools within G Suite for Education as well as get you thinking about how the tools apply to your classroom. In the course I’ve included examples for math, science, social studies, and language arts in elementary, middle, and high school settings.